You probably know what contractors think about your government’s permitting process, or what business owners think of the downtown streets, because many governments regularly survey their constituents to gather feedback and opinions. But what about your own employees? Do you have a regular process for asking them how the organization’s internal services are functioning? Do you collect customer service feedback about HR, finance (including budget), IT and purchasing services from the managers and employees who use them? What about for fleet and facilities maintenance services? Just as seeking customer feedback is a best practice for direct services to the public, it should also be one for internal support services. Internal customer surveys are a good way to find out how support services are functioning. They can give you valuable insights that promote innovation, help retain talent, increase job satisfaction and encourage continuous improvement. Internal customer surveys can also increase the overall performance of the government because an organization that cares about its employees’ opinions and acts on their suggestions is better positioned to fulfill its constituents’ needs. There’s always the risk of employees in a department feeling like they’re being attacked by their colleagues. The goal should always be to gather useful information and constructive ideas that can improve the way your organization does business. To maximize the learning you’ll gather from surveying employees, consider the following ideas. Send one survey from the city or county manager or other executive office, not the departments in question. When the head of the organization asks about how these services are doing, it sends a very different message than when the human resources department or the budget office asks how it’s doing. Endorse the survey and let employees know this approach is an impartial search for feedback, which is part of the organization’s continuous improvement program. Conveying interest in the results and an intent to act on them will reassure employees this is a valuable exercise. Assure respondents their answers are confidential. Employees may be reluctant to honestly assess the services they use for fear the information can be traced back to them. Provide plenty of assurance that identifiable information will be kept confidential. Make sure employees know the information will be used to spur improvement, not to punish anyone. Ask a third party to administer it. Enlisting the help of a third party to administer the survey and tabulate results helps convince respondents that the process is professional and trustworthy. Be transparent about the process and provide regular updates on it. Let employees know the timeline involved and release the results as soon as they’re available. This boosts confidence in the exercise and makes future participation more likely. Act on the information you gather. It’s demoralizing to employees when they take the time to offer their ideas and assessments, only to see them disappear into a void or sit on a shelf. By taking steps to address the issues they raise, you’ll show employees their feedback is truly valuable to the organization and they’ll have a stake in the improvements that are made. Repeat the survey regularly. This allows the organization to track improvement over time. The repetition is another way to demonstrate to employees that seeking feedback is just a basic task for a best-practice organization and that their ideas are important. 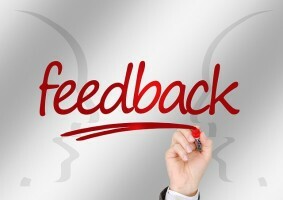 Governments have vastly improved the way they gather feedback from constituents and use it to enhance their performance. Viewing internal customers as valued constituents and soliciting their ideas as a way to identify needed changes will help create an organization that’s continuously improving.